A friend of mine posted a pasta dish she made with radicchio recently and the flavor combination was interesting. Since I don’t eat a whole lot of pasta, I wanted to use those flavors in another way. Of course quinoa is my go-to carb because it’s super clean and has more protein than any other starch. 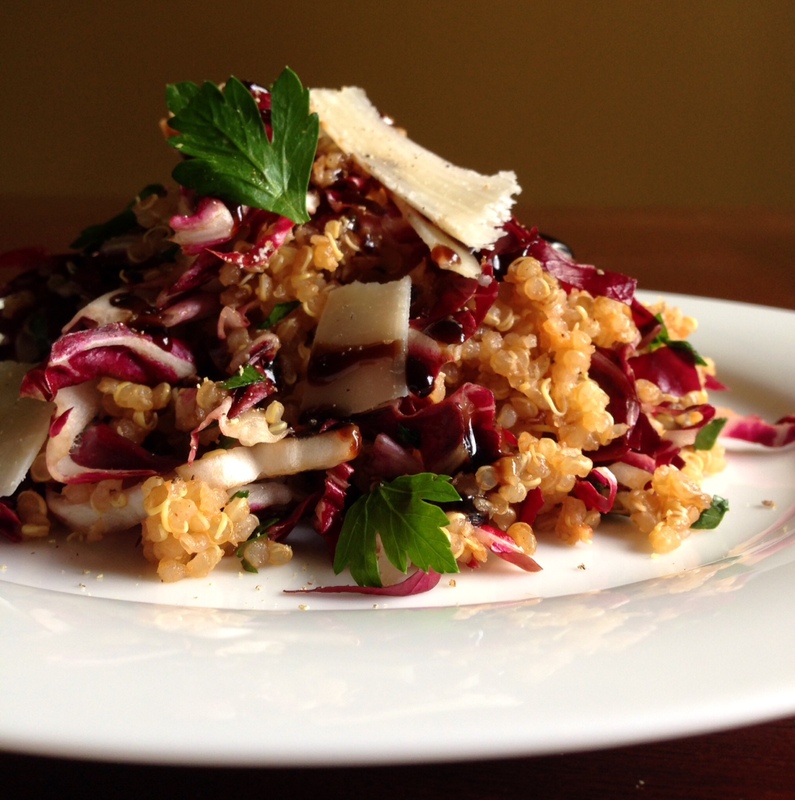 So yes, here is another quinoa recipe that even my picky strongman boyfriend ate with very little grumbling. DIRECTIONS: Bring 2 cups of stock to a boil and add quinoa. Reduce heat to low, cover and cook until liquid evaporates; about 20 minutes (do NOT overcook). Heat olive oil in a large saucepan over medium heat. Add garlic and stir for 30 seconds; then add tomato paste and stir for another 30 seconds. Pour in reserved 1/3 cup of stock and stir garlic/tomato paste until it reduces by half and it’s all incorporated. Add quinoa back into the skillet and stir until garlic mixture is evenly distributed. Drizzle a TBSP of balsamic into quinoa along with salt and pepper to taste. Remove from heat; toss in radicchio and parsley. Pour onto a serving platter. Drizzle with more balsamic glaze and top with the shaved parm and reserved parsley. Enjoy!